Best Hollywood attractions. See the famous Hollywood sign, find your favorite movie star on the Hollywood walk of fame, enjoy a Hollywood studios tour, shop on Rodeo Drive and more. Hollywood is also home to Universal Studios and the new Wizarding World of Harry Potter. 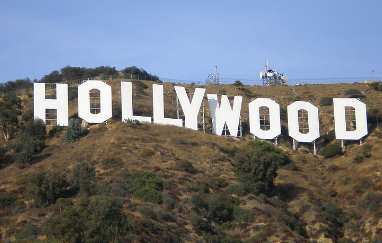 Hollywood is a district in Los Angeles, California, located about 125 miles north of San Diego. It is the historical center of the movie studios and movie stars of the American cinema. The favorable climate in Southern California was perfect for the film industry, so by 1915, most major films were being made in the Los Angeles area. The Hollywood Walk of Fame was created in 1958 to honor actors, artists and other significant contributors to the entertainment industry. In 1985 the Hollywood Boulevard Commercial and Entertainment District was officially listed in the National Register of Historic Places, ensuring these key buildings will be preserved for future generations. While many major film studios have moved to other areas within the greater Los Angeles area, Paramount Pictures is still physically located in Hollywood California. You can enjoy a Hollywood studio tour at Paramount Pictures, Universal Studios and other nearby LA studios. North Hollywood is home to the NoHo Arts District. Universal Studios is on the border of Hollywood and North Hollywood. West Hollywood includes the famous Sunset strip, full of restaurants and nightclubs. Nearby is Beverly Hills, home to many Hollywood movie stars and expensive shopping in the boutique stores on Rodeo drive. The Hollywood Walk of Fame has over 2400 stars embedded in the sidewalk along Hollywood Boulevard in Hollywood, California. 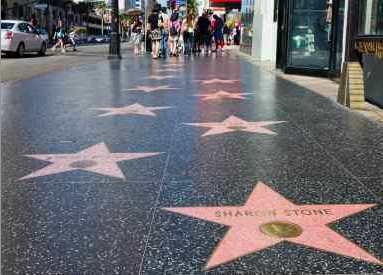 This popular Hollywood attraction receives over 10 million visitors a year. The Hollywood Walk of Fame stars include actors, musicians, directors, producers, music and theatre groups, fictional characters (like Mickey Mouse) and others who have made significant accomplishments to the entertainment industry. Your California vacation should include a trip to see your favorite star. The Go Select Hollywood tour gives you these Hollywood tours in one package: Universal Studios Hollywood, Sony Pictures Studio Tour, Paramount Pictures Studio Tour, Warner Bros. Studio VIP Tour and Kodak Theatre Guided Tour. See the best of Hollywood Go Select Los Angeles! Hollywood CityPass package offers discounts to 4 top Hollywood attractions: Starline Tours of Hollywood (star home tour), Madame Tussauds Hollywood Wax museum, Red Line Tours Hollywood Behind-the-Scenes and a choice of either the Dolby Theatre Tour or The Hollywood Museum Visit 4 Hollywood attractions for just $59.00 CityPass price - $103.95 value! There are also many additional discounts available for Southern California theme parks, including Universal Studios Hollywood tours. If you are visiting downtown Hollywood, stop by the Kodak Theater, home of the Academy Awards, and you can view the Hollywood sign on the hills in the distance. 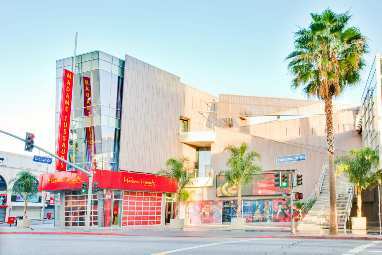 The theater is located at the corner of Hollywood Blvd. and Highland Ave.
Another one of the best places to view the Hollywood sign is the Griffith Park Observatory. 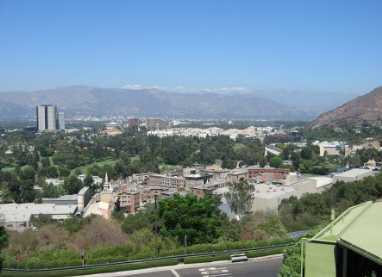 This location offers a closer view of the Hollywood sign, and great view of Los Angeles. The observatory sits in Griffith Park, which also has hiking trails, playground areas, and the Los Angeles Zoo. The Academy Awards are held every year in Hollywood Calif. The Academy Awards are currently held at the Kodak theater at the corner of Hollywood Blvd. and Highland Ave. during later February/early March. The annual Hollywood Christmas Parade is held on the weekend after Thanksgiving. The 3.5 mile route goes down Hollywood Boulevard.